When I start a book, I like to finish them, even if I'm not enjoying the book. I've had people ask my why bother reading a book if your not enjoying it, and I guess it's because I'm worried that if I put the book down it will be just before the turning point in the book and miss out a great story. Yeah, I should have put this one down, the story wasn't believable in the least and I found myself constantly frustrated with the choices Ginny made. The concept of the book was promising but SO flawed. Now I read a lot of science fiction and fantasy so I get the whole concept of suspension of disbelief, however, I like my realistic fiction to be well... realistic and believable. 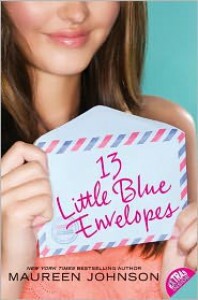 My main issue with 13 little blue envelopes is that NO parent in there right mind would let their 17 year old go off to Europe alone with absolute no contact with them for a month. (especially in a post 9/11 world) When I was 17 (pre 9/11) my high school's music department went on a 10 day Europe Tour and my parents almost didn't let me go. They had some LONG discussions about the subject and I was eventually able to go. There is NO WAY I would have been permeated to go traipsing around Europe by myself with no idea where I was going with only $1000 and envelopes from my "crazy" aunt with instructions that I'm not allowed to open before leaving. Not to mention that she couldn't call or e-mail anyone in the US to let them know she alive. Especially when she makes stupid choices like the one that almost gets her raped in Rome. Based on the tiny bit of information provided int he beginning of the book about her mom I have a very hard time believing she would be okay with this arrangement. Yeah, I had a real hard time with this one. 1 star for the potential, but I'm sorry I couldn't get past the apparent flaws in the plot, not at all realistic. It was also rather annoying that her backpack along with the 13th envelope gets stolen. Not sure if the author was planing on writing a sequel when she first wrote this but talk about leaving an opening for one. I will most certainly not be picking upThe Last Little Blue Envelope.